"We would like to take this opportunity to thank all of you for your support of our African wild dog work in Kenya. It's your generosity that moves this work forward! 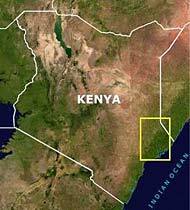 Even though these are very challenging times in Kenya, we continue to expand our community-based education program. Our education program director, Hussein Haji, continues his travels throughout the community to share wild dog natural history with villagers, including showing DVDs. Most school children living along or near the Tana River in the Masalani subregion have learned basic facts about wild dog family life. In this subregion, we estimate that our education efforts have reached 80% of the people! And last month, Hussein traveled to three villages east of Masalani, giving presentations to over 90 women and men! Hussein is working hard to educate the community. In January, he will travel to Nairobi to receive advanced training to enable him to oversee local wildlife clubs. The Conservancy also continues to document livestock depredation and monitor wild dog presence and absence, linking education and applied conservation. We hope you will consider donating to this very worthy cause. All funds received will go towards paying our education program director's salary." Only about 3% of the earth’s land is set aside in parks and game reserves and these areas are becoming increasingly isolated. 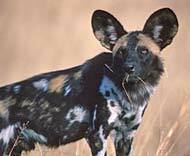 African wild dogs exist at low densities, range widely outside park boundaries, and are particularly vulnerable to extinction as the human population increases and landscapes become in increasingly fragmented. Saving this unique predator requires community-based action and education because unprotected lands form critical wildlife corridors and provide spatial requirements that wild dogs need to survive. Two high priority species - the Endangered wild dog and the Critically Endangered Hirola Antelope, a prey species - are found in South-eastern Kenya, a biodiversity rich mosaic of community lands and small reserves. Internationally recognized as a critical conservation region, the entire area is included in the Coastal Forests of Eastern Africa and the Horn of Africa Biodiversity Hotspots. Due to past civil strife little is known about many threatened species in this remote region, including a population of wild dogs about which virtually nothing is known. This is a potentially key population linking wild dogs in the Horn of African. Click through to the African Wild Dog Conservancy's donation page, which includes options for making a donation by post or by Paypal. In partnership with the Kenya Wildlife Service and local communities, this pioneering project is the first to study the conservation status and ecology, and the effects of traditional practices, religious beliefs, and human activity on wild dogs in the Biodiversity Hotspots of SE Kenya. This area is culturally diverse with seven tribes. The project is also the first study to investigate the potential impact of wild dog predation on the last known population of hirola antelope. Training and working with local people is an integral part of this project with the aim of empowering communities to implement innovative conservation measures to help protect their natural heritage, and create educational programs to raise local awareness of the importance of the environment and wildlife conservation. Kim McCreery and Robert Robbins co-direct the SE Kenya Community Wild Dog Conservation Project and founded the African Wild Dog Conservancy, a registered 501(c)(3) whose mission is to work with local, national, and international stakeholders to help save this highly endangered species. Having conducted a nine-year study of the social behavior and ecology of wild dogs in Hwange National Park for the Department of National Parks and Wildlife Management of Zimbabwe, Bob and Kim are dedicated veterans committed to conserving wild dogs. To find out more about the Conservancy and its conservation projects, please visit our site. If you'd like to support the invaluable work of the African Wild Dog Conservancy by making a donation, please click through to our site to make a donation by mail or Paypal.